The human bcl-6 proto-oncogene has been found to be mutated in both neoplastic and normal B cells. We used CL-01 cells, our monoclonal model of germinal center differentiation, and normal human B cells to explore the induction requirements and the modalities of bcl-6 hypermutation. As we have previously shown, CL-01 cells are IgM+ IgD+ and effectively mutate the expressed Ig VHDJH and VλJλ genes and switch to IgG, IgA, and IgE upon B cell receptor engagement and contact with CD4+ T cells through CD40:CD154 and CD80:CD28 coengagement. In this paper we showed that the same stimuli induce somatic hypermutation of bcl-6 in CL-01 and normal IgM+ IgD+ B cells. bcl-6 hypermutation was not accompanied by translocation of this proto-oncogene or hypermutation of the β-actin gene, and it did mimic Ig hypermutation. It was associated with transcription initiation, in that it targeted the first exon and a 696-bp sequence immediately downstream (∼0.6 kb) of the transcription initiation site while sparing further downstream (∼2.5 kb) and upstream (∼0.1 kb) areas. bcl-6 hypermutation displayed an overall rate of 2.2 × 10−4 changes/base/cell division with characteristic nucleotide preferences and showed strand polarity. These findings show that B cell receptor engagement promotes hypermutation in genes other than Ig, and suggest that cis-regulating elements similar to those of the Ig locus exist in bcl-6. Immunoglobulin gene somatic hypermutation occurs within the germinal center at a stage in B cell development that follows V(D)J rearrangement. It precedes terminal B cell differentiation and introduces 10−4–10−3 changes/base/cell division in Ig V(D)J genes. This mutation rate is at least a million-fold higher than that of all other genes in mammalian cells (1, 2, 3, 4), implying that the Ig hypermutation mechanism is different from the mechanisms that generate spontaneous mutations. It diversifies B cells and provides the structural correlate for Ag-driven intraclonal selection and affinity maturation (5, 6, 7). The mutated B cells expressing a B cell receptor (BCR)3 with higher affinity for Ag are selected over lower affinity BCR cells, and will go on to differentiate thereafter into Ig memory or plasma cells. Somatic Ig hypermutation yields mostly single base substitutions, very rarely deletions or insertions, and it is associated with transcription (4, 8, 9, 10, 11). Mutations concentrate within the 1- to 2-kb area that lies downstream of the Ig V region initiation of transcription and includes the V(D)J region sequence, while sparing the constant (C) region sequence (12). In addition, they favor transitions over transversions and seem to preferentially target certain hotspots (8). Finally, they display marked strand polarity, although which DNA strand is the preferential substrate of the mutation process is unknown (9, 11). Ig somatic hypermutation has been shown to be dependent on the presence of the intronic Ig μ enhancer (iEμ) (10, 12, 13). Foreign sequences can be substituted for V(D)J and still function as targets for hypermutation, suggesting that cis-acting elements outside the mutable region regulate and target mutations (14, 15), as also further indicated by the high frequency of point mutations in c-myc and bcl-2 proto-oncogenes brought under the influence of the Ig promoter and iEμ as a result of chromosomal translocation (16, 17, 18, 19, 20). These findings, together with the demonstration that Ig V(D)J genes mutate when the Ig promoter is replaced with another promoter, imply the possibility that the hypermutation process may target non-Ig genes. Consistent with this is the recent suggestion that bcl-6, a proto-oncogene encoding a POZ/Zinc finger transcriptional repressor normally required for germinal center formation, can accumulate somatic point mutations not only in lymphoma B cells, where it is frequently translocated into the Ig locus, but also in normal B cells (21, 22, 23). Whether endogenous bcl-6 is targeted by the hypermutation machinery outside of the Ig gene locus (that is, it mutates without translocation) and whether bcl-6 hypermutation is induced by the same molecular trigger(s) of Ig hypermutation remains to be formally demonstrated. We used CL-01 cells, our monoclonal model of germinal center B lymphocyte differentiation, as well as normal human B cells to address the issue as to whether the physiological induction of the Ig somatic hypermutation machinery results in the targeting of DNA sequences outside the Ig gene locus. As we have shown, CL-01 cells are surface IgM+ IgD+ and can be induced to effectively switch to IgG, IgA, and IgE, and mutate the expressed VHDJH-Cμ, VHDJH-Cδ, VHDJH-Cγ, VHDJH-Cα, VHDJH-Cε, and VλJλ-Cλ transcripts before and after switching in a stepwise fashion, upon BCR engagement and contact with activated T cells (24, 25, 26, 27, 28). As we also have shown, in CL-01 cells, Ig hypermutation and class switching are part of an overall program of coordinated germinal center differentiation that includes phenotypic changes, such as modulation of CD38 and CD77 expression, and increased levels of cytoplasmic Ig leading to a plasmacytoid phenotype (24, 25). We show here that in both CL-01 cells and normal human B cells the stimuli that induce Ig class switching, Ig hypermutation, and plasmacytoid differentiation also induce high rate of mutations in bcl-6. The same induction requirements, the same dependency on transcription initiation and similar mutational modalities suggest that certain cis-acting element(s), structurally or functionally similar to the cis-acting element(s) in the Ig locus, are present in the bcl-6 locus, and that these elements are recruited by the same or vastly overlapping trans-activating pathways by the Ig hypermutation machinery. The human CL-01 B cell line has been reported (24, 25, 26, 27, 28). CL-01 cells are monoclonal, as shown by Southern blotting with labeled JH probes, and by the expression of unique VHDJH-Cμ and VHDJH-Cδ transcripts. They display on both chromosomes the switch (S)μ, ςδ, and Sγ3, Sγ1, Sα1, Sγ2, Sγ4, Sε, and Sα2 regions in germline configuration, and no VHDJH rearrangement in the nonfunctional chromosome (24, 26). CL-01 cells express the phenotype of germinal center founder centroblasts, including surface IgM, IgD, CD38, and CD77 (24). These cells were cultured in RPMI 1640 medium (Life Technologies, Gaithersburg, MD), supplemented with 10% heat inactivated FCS, 2 mM l-glutamine, 100 U/ml penicillin, and 100 μg/ml streptomycin (FCS-RPMI) at less than 105/ml. Normal human PBMCs were isolated from healthy subjects and depleted of T cells by sheep RBC rosetting, as described (24, 25, 26). T cell-depleted cells were first reacted with a biotinylated mouse mAb to human IgD (Southern Biotechnology Associates, Birmingham, AL), and then with magnetic MACS MicroBeads conjugated with streptavdin (Streptavidin MicroBeads; MACS Technology, Miltenyi Biotec, Auburn, CA). sIgD+ B cells were purified using a magnetic MiniMACS sorter (Miltenyi Biotec). FACS analysis demonstrated that virtually all these purified surface IgD+ B cells were also surface IgM+ (data not shown). CD4+ T cells were positively selected from normal human PBMCs, prepared by fractionation through Histopaque 1077 (Sigma, St. Louis, MO) using anti-CD4 mAb-conjugated magnetic beads (Miltenyi Biotec). CD4+ T cells were cultured in FCS-RPMI and expanded by weekly stimulation with irradiated (1200 rads) PBMCs, 100 μg/ml of PHA (Life Technologies), and 100 U/ml of human rIL-2 (Life Technologies). CD4+ T cells were used at least 2 wk after the last stimulation, and were incubated for 6 h with 20 ng/ml of PMA (Sigma), and 500 ng/ml of ionomycin (Calbiochem-Novabiochem, San Diego, CA) before culture with B cells. CL-01 or normal naive IgM+IgD+ B cells (0.5 × 106) were cultured in the presence or absence of 2.5 × 106 irradiated and activated CD4+ T cells in a flat-bottom 6-well (5.0 ml FCS-RPMI volume) plate, in the presence of human rIL-2 (Life Technologies) and rIL-4 (100 U/ml) (Genzyme, Cambridge, MA). To cross-link the BCR, CL-01 or normal B cells were reacted for 2 h at 4°C with Sepharose-conjugated rabbit Ab to human Ig μ chain and rabbit Ab to human Ig (H + L) chain (Irvine Scientific, Santa Ana, CA; mixed 1:1 at 2 μg/ml) (anti-BCR Ab), and then washed with cold PBS. After 7 days of culture, the B cells were collected, freed of dead cells and debris by fractionation through Histopaque 1077 (Sigma), reacted again with anti-BCR Ab, washed, and re-seeded over a fresh layer of irradiated T cells in the presence of fresh cytokines. At day 14 of culture, the B cells were collected for genomic DNA or total RNA extraction after removal of residual T cells by absorption with anti-CD3 mAb-conjugated magnetic beads (Miltenyi Biotec). The CD40:CD154 and CD80:CD28 interactions were blocked by preincubating T or B cells with saturating amounts (30 μg/ml) of mouse 24-31 mAb to human CD154 (Ancell, Bayport, MN), mouse CD28.2 mAb to human CD28 (PharMingen, San Diego, CA), or mouse BB1/B7-1 mAb to human CD80 (PharMingen). Mouse Ber-H2 mAb to human CD30 (Dako, Carpinteria, CA) was used as a “control” mAb. Genomic DNA was extracted from 2 × 106 CL-01 B cells using the QIAamp Tissue kit (Qiagen, Chatsworth, CA). Three genomic DNA areas located upstream, immediately downstream, or further downstream of the transcription initiation site (residue +1) of the bcl-6 gene were amplified by PCR (Fig. 1⇓). The bcl-6 DNA encompassing residues −61 through −400 bp upstream of the transcription initiation site (area A) was amplified with the sense primer Bcl6 up2S (5′-GCTTGAGGGATTAGATAGGGAAAG-3′) and the antisense primer Bcl6 up3AS (5′-GTAGGGTTAGAGAGGCGAGTAAG-3′). The bcl-6 DNA encompassing residues +587 through +1282 bp downstream of the transcription initiation site (area B) was amplified using the sense primer Bcl6down1S (5′-CTGCCGCCGCCGCTGCTCATGA-3′) together with the antisense primer Bcl6down2AS (5′-CCTTCCAAATCTCGGTTCGG-3′). The bcl-6 DNA encompassing residues +2525 through +3037 bp further downstream of the promoter region (area C) was amplified using the sense primer Bcl6down3S (5′-TGACCACCTCAGAGAGCCAATCTC-3′) and the antisense primer Bcl6down4AS (5′-TCCAGGAATAGCGTGTGGACTAGG-3′). The PCRs were performed using Pfu Turbo DNA polymerase (Stratagene, La Jolla, CA) (the error rate of the Pfu Turbo is about 1.3 × 10−6 changes/base/cycle) and the reaction buffer provided by the manufacturer with 30 cycles, each cycle consisting of a 1-min denaturation at 94°C, a 1-min annealing at 60°C, and a 1-min extension at 72°C. The amplifications were completed by an additional 10-min extension at 72°C. The PCR products were purified with the PCR purification kit (Qiagen) and ligated into the pCR-Script SK vector (pCR-Script Cloning kit, Stratagene), which was used to transfect into XL1-Blue MRF Supercompetent cells (Stratagene). The (positive) white bacterial colonies were screened by PCR using the primers described above. The individual colonies that had been directly used as PCR templates were seeded onto a fresh Luria-Bertani plate and expanded overnight. The clones containing bcl-6 DNA were selected for single-strand conformational polymorphism (SSCP) analysis. BCR engagement and activated T cells induce bcl-6 hypermutation in human B cells. Upper panel, Schematic representation of the bcl-6 gene. Open and filled boxes represent noncoding and coding exons, respectively. The arrow indicates the transcription initiation site. The thick black lines indicate the bcl-6 areas analyzed. Lower panels, Frequency of bcl-6 mutations in CL-01 cells cultured for 14 days in FCS-RPMI alone; in FCS-RPMI alone after BCR engagement; in FCS-RPMI with activated T cells; and in FCS-RPMI with activated T cells after BCR engagement. The mutation frequencies depicted here took into account only the 54 independent point mutations. Therefore, the mutation frequency (8.8 × 10−4 changes/base) of the bcl-6 area B in B cells cultured with activated T cells upon BCR engagement (B) is slightly lower than that calculated taking into account the all point mutations (1.5 × 10−3 changes/base) taking account all point mutations (independent plus shared mutations) in the same area. Area A encompasses the intronic residues −400 through −61 bp; area B encompasses the intronic residues +587 through +1282 bp; and area C encompasses the intronic residues +2525 through +3037 bp. RNA was extracted from 2 × 106 CL-01 or normal B cells using the RNeasy Mini Kit (Qiagen). mRNA was reverse transcribed using the SuperScript Preamplification System (Life Technologies) for first-strand cDNA synthesis. The bcl-6 gene first exon sequence encompassing residues +23 through +278 bp downstream of the initiation of transcription (Fig. 2⇓) was amplified using cDNA as a template and the specific sense Bcl6ex1S (5′-AACCTCCAAATCCGAGACGC-3′) and antisense Bcl6ex1AS (5′-CTGGTGTCCGGCCTTTCCTAG-3′) primers. The β-actin sequence encompassing residues 745-1095 bp (GenBank accession number: NM001101) was amplified using cDNA as a template and the specific sense β-actinF (5′-GCAAGAGATGGCCACGGCTGCTTC-3′) and antisense β-actinB (5′-ATCCACACGGAGTACTTGCGCTCA-3′) primers. DNA amplification and cloning were performed as described above. CD40:CD154 and CD80:CD28 coengagement is required for the induction of bcl-6 hypermutation. Targeting of the first bcl-6 exon by somatic hypermutation as assessed by analysis of mRNA transcripts. Upper panel, Schematic representation of the bcl-6 gene. Open and filled boxes represent noncoding and coding exons, respectively. The arrow indicates the transcription initiation site. The thick black line indicates the bcl-6 area analyzed. Lower panel, Mutation frequency of the bcl-6 transcript sequence encoded by the first exon of bcl-6 gene in CL-01 cells cultured for 14 days in FCS-RPMI alone; in FCS-RPMI with activated T cells alone; in FCS-RPMI alone after BCR engagement; in FCS-RPMI with activated T cells after BCR engagement; in FCS-RPMI with activated T cells after BCR engagement in the presence of anti-CD154 mAb; in FCS-RPMI with activated T cells after BCR engagement in the presence of anti-CD28 mAb; and in FCS-RPMI with activated T cells after BCR engagement in the presence of anti-CD80 mAb. Mutated bcl-6 genomic DNA or bcl-6 and β-actin cDNAs were identified by SSCP analysis, performed essentially as previously reported (27). DNA for SSCP analysis was amplified by PCR (30 cycles of a 1-min denaturation at 94°C, a 1-min annealing at 60°C, and a 1-min extension at 72°C) using genomic DNA or cDNA cloned into pCR-Script SK vector as template, in a 10 μl reaction volume with Taq DNA polymerase (Life Technologies) in the presence of 1 μCi [α-32P]dCTP (NEN Life Sciences, Boston, MA) (3000 Ci/mmol). The same primers used to amplify bcl-6 genomic DNA and cDNA were used for SSCP analysis. We previously demonstrated that a single nucleotide change in a 200- to 400-bp DNA sequence is sufficient to alter DNA mobility in the SSCP gel (27). Therefore, bcl-6 DNA fragment A (340 bp) and bcl-6 exon 1 cDNA (256 bp) were analyzed as such. DNA fragments B (696 bp) and C (513 bp) were digested with MspI before analysis to yield 321/375- and 285/228-bp fragments. The DNA fragments were diluted 1:15 in 10 mM EDTA and 0.1% SDS. The diluted DNAs were mixed with an equal volume of sequencing stop solution containing 95% formamide, 20 mM NaOH, 20 mM EDTA, 0.05% bromophenol blue, and 0.05% xylene cyanole. The samples were denatured for 10 min at 98°C, chilled on ice, and immediately loaded in 3 μl aliquots onto a 6% acrylamide gel (20:1 acrylamide:bisacrylamide) with 1× TBE containing 10% glycerol. Electrophoresis was performed at room temperature for 18 h at 5 W. The gels were autoradiographed using Kodak X-Omat AR films (Kodak, Rochester, NY). The clones displaying an altered electrophoretic mobility in the SSCP gel were analyzed by sequencing to confirm and characterize the nature of the mutations. Plasmids were extracted using the QIAprep Spin Plasmid Miniprep Kit (Qiagen), and sequenced on both strands using Taq DiDeoxy Terminator Cycle Sequencing Kit and a 373 Automatic Sequencer (Applied Biosystems, Foster City, CA). To identify mutations, the sequence of genomic DNA areas A, B, and C, as well as bcl-6 exon 1 or β-actin cDNA from induced CL-01 cells, were compared with the respective DNA and cDNA sequences from CL-01 cells cultured in FCS-RPMI alone (nonstimulated and noninduced), using the MacVector v.5.0 software (International Biotechnologies, New Haven, CT). Because bcl-6 mutations were found to occur at a significant frequency in Burkitt’s lymphomas (22), we first determined the bcl-6 sequence in CL-01 cells by analyzing 45 independent genomic DNA clones of areas A, 45 of area B, and 45 of area C. The 45 area A and 45 area C bcl-6 clones were all identical in sequence and identical to the reported sequence of the human bcl-6 gene (GenBank accession no. Z79581) (29) (Fig. 1⇑). 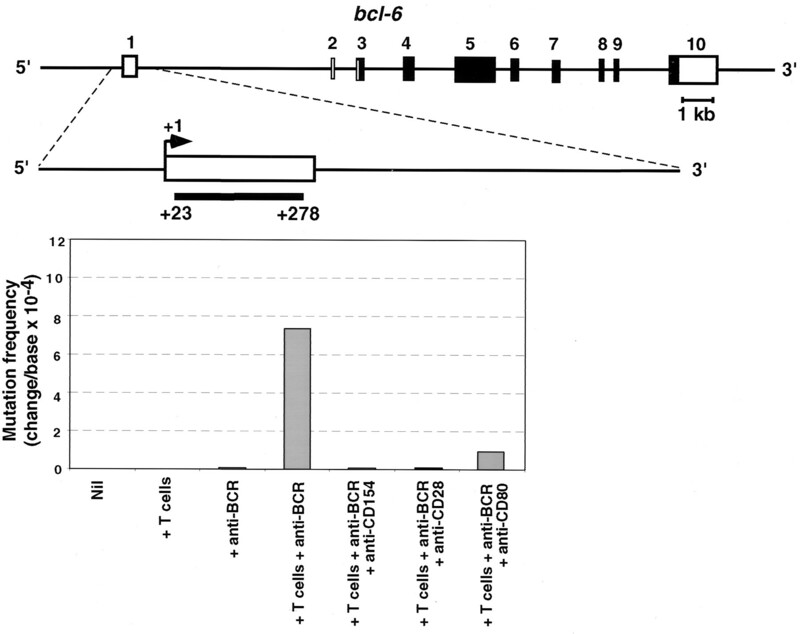 The 45 area B bcl-6 clones were also all identical but differed from the reported sequence of the human bcl-6 gene by three nucleotides residues and one single-nucleotide deletion, suggesting that unstimulated CL-01 cells carried only one copy of bcl-6, possible consisting of an allelic variant or slightly mutated form of the reported bcl-6 sequence. The census of the somatic point mutations was performed by counting only once identical mutations in more than one collinear DNA sequence. It was assumed that identical base changes in collinear DNA sequences were due to the same mutational events (shared mutations), although some of these mutations might have arisen as a result of hotspots, and therefore could actually represent independent mutations. The comparisons of the observed with the expected number of mutations for each individual nucleotide residue to each of the three other nucleotides were performed using a contingency table (χ2 test). The expected frequency of mutations was calculated by taking into account the base composition of the unmutated CL-01 bcl-6 genomic DNA sequence; that is, it was corrected by considering the frequency of occurrence of the individual nucleotides, or dinucleotides, within the CL-01 bcl-6 sequence assuming randomness. The 1.7-kb BCL-6-MBR probe (Fig. 3⇓C) encompassing residues −400 through +1282 bp within the major break-point region (MBR) of bcl-6 gene was prepared by PCR amplification from human placenta genomic DNA (Sigma) using the sense primer Bcl6 up2S and the antisense primer Bcl6down2AS, and verified in sequence. Genomic DNA from human placenta and induced or noninduced CL-01 cells was digested with the restriction enzymes BamHI or XbaI, loaded on a 0.8% agarose gel for electrophoresis, and then transferred to Immobilon-Ny+ transfer membrane (Millipore, Bedford, MA). 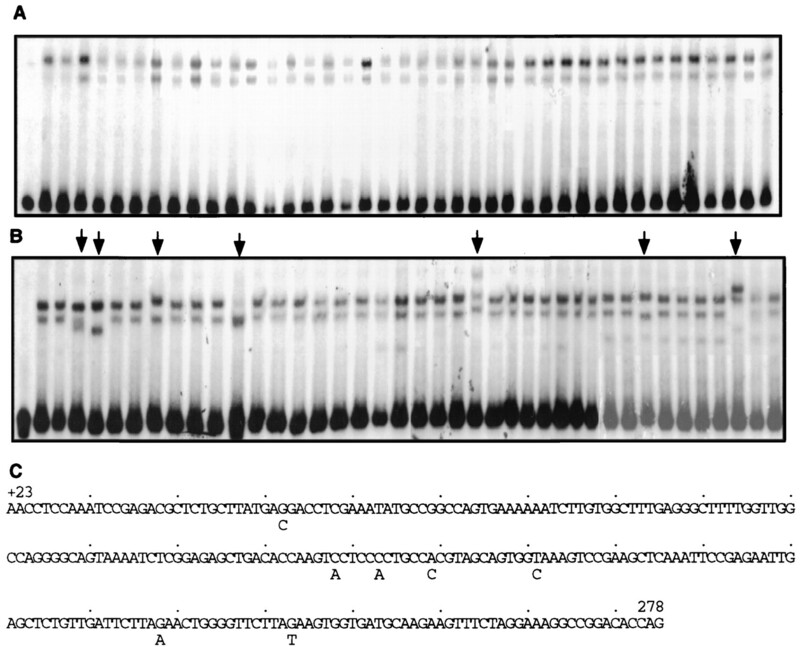 The blotted DNA was hybridized with the BCL-6-MBR probe, labeled with [α-32P]dCTP using the Random Primer DNA labeling kit (Boehringer Mannheim, Indianapolis, IN), washed, and then detected by autoradiography using Kodak X-Omat AR film. Germline configuration of the bcl-6 gene in CL-01 cells. 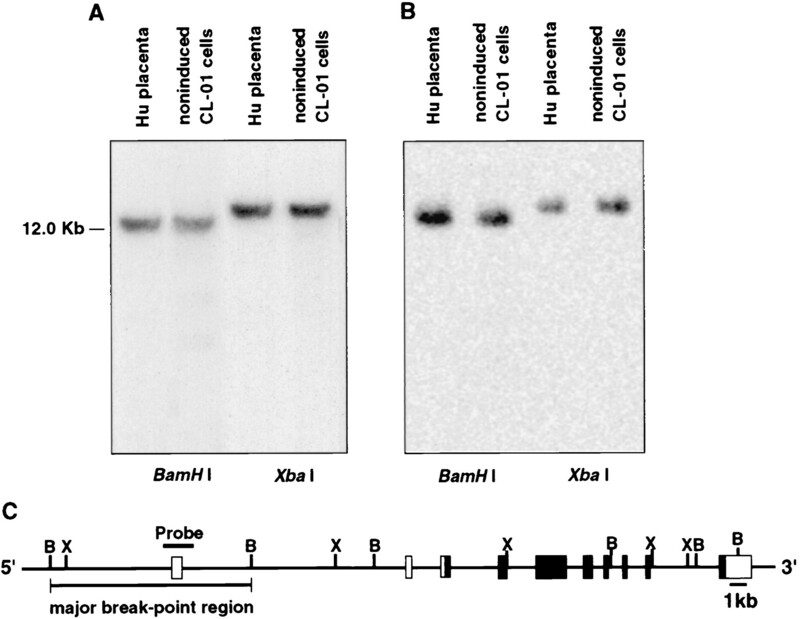 Southern blot analysis of genomic DNA from non induced (A) or induced (B) CL-01 cells after hybridization with the ∼1.7-kb MBR probe. 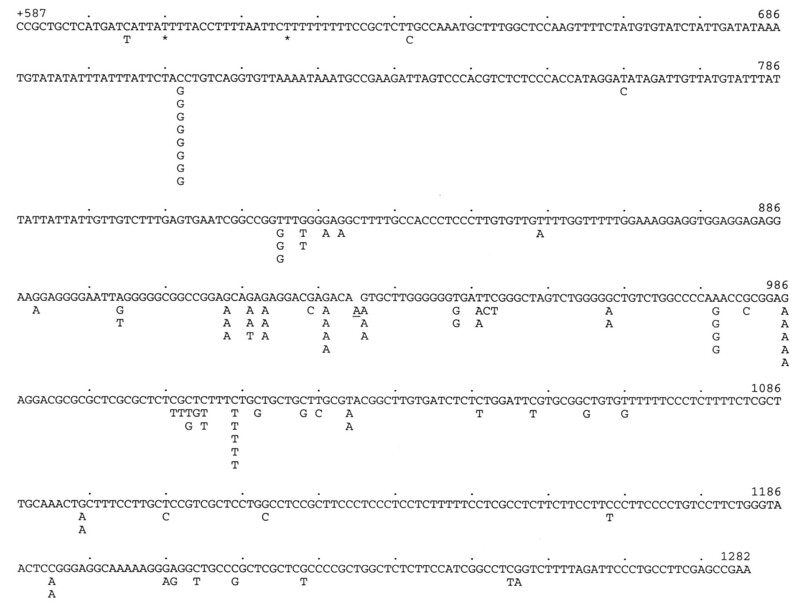 C, The restriction map of the human bcl-6 gene with the probes used in the Southern blotting analysis. B, BamHI; X, XbaI. To determine whether the same stimuli that induced Ig V(D)J gene somatic hypermutation, could induce hypermutation in the bcl-6 gene, CL-01 cells were reacted with anti-BCR Ab and then cultured with activated human CD4+ T cells, according to the same protocol originally devised for the induction of Ig hypermutation (27). After 14 days, genomic DNA was extracted from the cultured cells. Selected genomic bcl-6 DNA sequences were amplified using specific primers and then cloned into appropriate vectors for PCR amplification in the presence of [α-32P]dCTP, and further analysis by our ad hoc devised SSCP, in a fashion similar to that previously used for the analysis of V(D)J mutations (27). As we have shown (27), one single base change in the analyzed DNA is sufficient to yield a shift in the SSCP gel band. Using this approach, we analyzed a 696-bp DNA sequence encompassing residues +587 through +1282 bp downstream of the initiation site of transcription (Fig. 1⇑, area B) that has been reported to be mutated in follicular lymphoma B cells (30). SSCP analysis revealed that 33 of 116 (>28%) DNA clones from CL-01 cells cultured with activated CD4+ T cells upon BCR engagement were mutated in the 696-bp DNA sequence of bcl-6 area B. Sequences of 26 of these 33 DNA clones revealed a total of 92 point mutations in addition to two 1-nt deletions and a 1-nt insertion (Fig. 4⇓). The overall 92 point mutations possibly resulted from 54 independent mutational events (Fig. 1⇑B) and corresponded to a frequency of mutation of about 1.5 × 10−3 changes/base, about 40-fold (p < 0.001) the frequency of mutations expected in this 696-nt sequence after 30 cycles of PCR amplification taking into account a Pfu Turbo error rate (about 1.3 × 10−6 changes/base/cycle). Only 1 of 46 (2.2%) of the corresponding DNAs was found mutated in this region in CL-01 cells cultured in FCS-RPMI alone or with activated T cells without BCR engagement. The single DNA with altered mobility in SSCP bore one single point mutation, yielding an overall mutation frequency of 3.1 × 10−5 changes/base (Fig. 1⇑B). Also, only 1 bcl-6 DNA area B fragment out of 30 analyzed (3.3%) was found to be mutated in CL-01 cells cultured with anti-BCR Ab in the absence of activated T cells (Fig. 1⇑B), yielding an overall mutation frequency of 4.8 × 10−5 changes/base, which was not significantly different from the overall mutation frequency expected on the basis of the Pfu Turbo error rate. Thus, BCR engagement and activated CD4+ T cells effectively induce somatic hypermutation in human B cell bcl-6. Somatic mutations within the bcl-6 5′-noncoding sequences (area B, encompassing residues +587 through +1282 bp downstream of the transcription initiation site). The base substitutions are indicated at each nucleotide position. Deletions are depicted by asterisks (∗), and insertions are underlined. The 92 point mutations, two 1-nt deletions, and a 1-nt insertion identified in the 26 bcl-6 gene segments from CL-01 cells cultured with activated CD4+ T cells after BCR engagement as compared with the sequences of unmutated bcl-6 gene template (unstimulated CL-01 cells). Different nucleotide changes found in different transcripts are in many cases listed in the same row, resulting in total of only 8 rows instead of a total 26 actual mutated DNAs sequenced. Our previous findings have determined that coengagement of the CD40:CD154 and CD80:CD28 stimulatory pairs is necessary, in addition to BCR engagement, for the induction of somatic Ig hypermutation in human B cells (27). To explore the role of CD40 and CD80 in the induction of bcl-6 hypermutation, CD154 and CD28 on the surface of activated T cells were blocked using mouse mAbs to human CD154 or CD28, respectively, in a 14 day T:B cell culture. To verify that hypermutation of the bcl-6 intronic DNA area B accompanied somatic hypermutation of the immediately adjacent exon(s), as it is characteristic of the Ig locus, we chose to analyze the 256-bp noncoding exon 1 mRNA sequence (encompassing residues +23 through +278 bp downstream of the transcription initiation site) (Fig. 2⇑). Six of 47 (12.8%) of the 256-bp exon 1 transcripts were found to be mutated in CL-01 cells cultured with activated T cells upon BCR engagement. These 6 mutated transcripts bore a total of 9 independent point mutations, which corresponded to a frequency of 7.5 × 10−4 changes/base, and a rate of about 1.9 × 10−4 changes/base/cell division (Fig. 2⇑). Blocking CD154 or CD28 on the surface of activated T cells made these cells ineffective inducers of hypermutation (30 bcl-6 exon 1 cDNA clones from the anti-CD154 culture and 30 bcl-6 exon 1 cDNA clones from the anti-CD28 culture analyzed) (Fig. 2⇑). That CD28 is required to engage CD80 (the CD28 complement on the B cell surface) to induce bcl-6 hypermutation was further indicated by the lack of mutations (43 bcl-6 exon 1 cDNA clones analyzed) in CL-01 cells cultured with activated CD4+ T cells in the presence of blocking mouse anti-CD28 mAb. The control anti-CD30 mAb failed to interfere the induction of the mutational machinery (data not shown), indicating that anti-CD154, anti-CD28, and anti-CD80 mAb ablated Ig hypermutation not by merely reducing or abrogating B:T cell contact, but rather by specifically interfering with CD40:CD154 or CD80:CD28 coengagement and related signaling. These experiments showed that CD40:CD154 and CD80:CD28 coengagement is crucial for induction of bcl-6 hypermutation and that bcl-6 hypermutation is not limited to the 5′ region of the first intron but also targets the exon 1 sequence. Having shown the induction of bcl-6 hypermutation mimics in requirements Ig somatic hypermutation, we addressed the issue as to whether the bcl-6 hypermutation process is also, like Ig hypermutation (3, 15, 31, 32, 33), associated with initiation of transcription. To this end, we analyzed a 340-bp sequence encompassing residues −61 through −400 bp upstream of the transcription initiation site (Fig. 1⇑, area A) and a 513-bp DNA sequence encompassing residues +2525 through +3037 bp further downstream of the transcription initiation site (Fig. 1⇑, area C). We reasoned that if bcl-6 hypermutation was associated with initiation of transcription in the same fashion as the Ig locus, it would target exon 1 and area B only, while sparing both areas A and C. These two additional areas were chosen to reflect the topography of Ig V(D)J hypermutation, which begins downstream of the gene transcription initiation site and continues through a 1- to 2-kb region (34, 35, 36, 37). In contrast to what found in bcl-6 intronic area B DNA and the exon 1 mRNA, no mutations were found in the area A upstream of the bcl-6 gene transcription initiation site in CL-01 cells cultured with anti-BCR Ab in the presence or absence of activated CD4+ T cells (30 and 24 DNA fragments analyzed, respectively). Only one mutated DNA clone was found in this region in CL-01 cells cultured in FCS-RPMI alone or in the presence of activated CD4+ T cells but not anti-BCR Ab (50 and 30 DNA fragments analyzed, respectively). Both mutated segments carried one point mutation each to yield overall mutation frequencies of 6.8 × 10−5 and 11.3 × 10−5 changes/base, respectively (Fig. 1⇑), which were not significantly different from the mutation frequency expected on the basis of the Pfu Turbo error rate alone (about 4.0 × 10−5 changes/base). Only one mutated DNA segment was found in the bcl-6 512-bp area C region in CL-01 cells cultured upon BCR engagement and in the presence of CD4+ T cells (50 DNA clones analyzed) or upon BCR engagement and in the absence of CD4+ T cells (36 DNA clones analyzed). No mutated DNA segments were found in the analysis of the bcl-6 512-bp area C in CL-01 cells cultured in FCS-RPMI alone or FCS-RPMI upon BCR-engagement but in the absence of activated CD4+ T cells (24 and 29 DNA clones analyzed, respectively). That the hypermutation in Ig V(D)J and bcl-6 genes is not a general feature of all transcribed genes in CL-01 cells was revealed by the insignificant mutation frequency at the β-actin locus, as judged by SSCP and cDNA sequencing analyses. Only 1 of 60 β-actin cDNA clones derived from the CL-01 cells stimulated with activated CD4+ T cells upon BCR engagement displayed an altered mobility in SSCP (not shown). This shifted clone carried only one point mutation, yielding an overall frequency of mutations of about 5.0 × 10−5 changes/base, a frequency not significantly different from that expected (about 4.0 × 10−5 changes/base) on the basis of the Pfu Turbo error rate. The 92-nt changes found in the bcl-6 area B DNA sequence comprised 54 independent mutations, distributed over 51 positions throughout the whole region. They yielded an overall independent point-mutation frequency of 8.6 × 10−4 changes/base, i.e., 2.2 × 10−4 changes/base/cell division (Fig. 1⇑), and showed a bias for transitions over transversions. Randomly occurring point mutations would be expected to be one-third transitions and two-thirds transversions, but almost 60% of the 54 independent point mutations in the 696-bp segment analyzed were transitions. G nucleotides were mutated at a frequency (37.0% of total point mutations), almost 50% higher than expected by chance alone (24.9%) after correcting for base composition. G→A transitions accounted for 65% of the total G mutations and 40.6% of all transitions (Table I⇓). The preferential targeting of G by mutations was associated with a scarcity of mutations in A (p < 0.001) and T (p < 0.001) (27). A preferential targeting of C nucleotides was also observed in bcl-6 mutations, 33.3% of total point mutations targeted C; that is, almost 30% higher than expected by chance alone (25.9%), with C→T transitions accounting for 61.1% of the total C mutations. The proportion of T mutations was about 50% higher than A, after correction for the base composition of the bcl-6 gene sequence, suggesting a strand polarity in the bcl-6 hypermutation, as further emphasized by the finding that G bases were more frequently targeted mutations than C bases (Table I⇓). AG dinucleotides and GAG trinucleotides were found to be preferentially targeted by mutations in the Ig VHDJH gene segments of induced CL-01 cells (27). To verify whether a similar preference was displayed by somatic hypermutation in bcl-6, we considered the 16 possible dinucleotides identified in the 696-bp sequence of bcl-6 gene area B and made a census of all the point mutations targeting these dinucleotides (Table II⇓). The AG and CG dinucleotides were mutated at a frequency significantly higher than that expected by chance alone (p < 0.001). This preference was not merely due to G and C biases, as G and C were mutated at a significantly lower frequency when occurring outside than within AG and CG (45% of total G mutations targeted AG dinucleotides, although the frequency of occurrences of the G nucleotides within the AG dinucleotides is only 17.4%, and more than 30% of total C mutations targeted the CG dinucleotides, although only 19.6% of total C nucleotides are within CG). Next, we examined the pattern of all 64 trinucleotides in the 696 bp bcl-6 gene sequence. The GAG trinucleotide was found to be preferentially targeted by point mutations. There were a total of 16 GAG trinucleotides within the 696-bp bcl-6 gene segment, i.e., 2.3% of all trinucleotides and 11 independent point mutations were observed in the GAG trinucleotide, which was about 3-fold higher than expected by chance alone (p < 0.001). In GAG, AG was preferentially targeted by mutations, containing 9 of the 11 mutations found in GAG, with 7 of the 9 mutations targeting the G base of the AG dinucleotide. Thus, the high frequency of mutations in GAG trinucleotide reflected the preferential targeting of the G base within the AG dinucleotide. The consensus sequence RGYW (where R = purine, Y = pyrimidine, and W = A or T) has been identified as a mutational hotspot in human and murine Ig genes (12, 38, 39), and in the bcl-6 gene of normal human germinal center B cells or in diffuse large cell lymphoma (22). In the bcl-6 gene area B 696-bp sequence, the RGYW motif occurred 14 times in six different iterations, which covered about 6.3% of the sequence. Nine point mutations were located in this motif, which corresponded to 16.4% of all independent mutations, a frequency more than 2.5-fold higher than expected by chance alone (p < 0.05). In human B cell lymphomas, bcl-6 mutations have been associated with translocation of this proto-oncogene into the Ig locus. In general, these translocations affect the band 3q27 and lead to bcl-6 activation by bringing bcl-6 under the effects of Ig promoters and other cis-acting elements of the locus (30, 40). In bcl-6, these translocations are associated with a MBR, as determined by Southern blot analysis (41). Our previous findings showed that CL-01 cells bear Ig switch regions in germline configuration on both chromosomes and carry no translocated DNA sequence in the region between JH and Sμ (24). Accordingly, Southern blot hybridization analysis performed on genomic DNA digested with the restriction enzymes BamHI or XbaI using a ∼1.7-kb genomic probe within the MBR showed no evidence of rearrangement of bcl-6 in a significant proportion of CL-01 cells before (Fig. 3⇑A) or after (Fig. 3⇑B) induction of somatic hypermutation. The lack of bcl-6 translocation was further supported by a long range PCR assay spanning 2409 residues between JH and Sμ, and providing no evidence of translocated DNA in the region between JH and Sμ in both induced and uninduced CL-01 cells (data not shown). We extended our findings to normal human B cells by analyzing the 256-bp bcl-6 noncoding exon 1 mRNA sequence in freshly isolated naïve IgM+ IgD+ B cells that were cultured in FCS-RPMI alone or that were reacted with anti-BCR Ab and then cultured in FCS-RPMI in the presence of activated human CD4+ T cells, according to the same protocol used for the induction of bcl-6 (present experiments) and Ig hypermutation (27). SSCP analysis of the 256-bp bcl-6 noncoding exon 1 revealed that none of the 40 cDNA clones from normal B cells cultured in FCS-RPMI alone without prior BCR engagement was mutated (Fig. 5⇓A). In contrast, 7 of 40 (∼18%) cDNA clones from the B cells cultured with activated CD4+ T cells upon BCR engagement were mutated; that is, they displayed an altered gel mobility (Fig. 5⇓B). Sequencing of these 7 cDNA clones displaying an altered SSCP mobility demonstrated that each of them contained one point mutation (Fig. 5⇓C), which yielded an overall mutation frequency of 6.8 × 10−4 changes/base. BCR engagement and T cell contact induce bcl-6 hypermutation in normal IgM+ IgD+ B cells. SSCP analysis of the transcript sequence encoded by the first exon of bcl-6 gene in unstimulated freshly isolated normal naïve IgM+ IgD+ B cells (A), or IgM+ IgD+ B cells from the same donor cultured in the presence of activated CD4+ T cells upon BCR-engagement (B). Arrows point to cDNA clones with altered gel mobility. The first lane in both A and B consists of nondenatured double-stranded cDNA. Each of the transcripts with altered SSCP mobility contained one somatic mutation, as detailed in C. Residues are numbered from the transcription initiation site (+1). The present findings demonstrate that the bcl-6 proto-oncogene can be induced to hypermutate in vitro in human B cells by the same stimuli that are required for the induction of Ig V(D)J hypermutation; that is, BCR engagement and contact with activated T cells through CD40:CD154 and CD80:CD28 engagement. They show that bcl-6 hypermutation displays all the characteristic features of Ig V(D)J hypermutation (Table III⇓), including: 1) association with initiation of transcription, 2) DNA strand polarity, 3) preference for single nucleotide substitutions, 4) bias for transitions over transversions, and 5) preferential targeting of selected nucleotide residues and hot spots. They establish that targeting of bcl-6 by the hypermutation machinery occurs in the absence of bcl-6 translocation into the Ig locus, indicating that the bcl-6 locus possesses cis-regulatory elements that are similar to those of the Ig locus and that may respond to the same trans-acting factors. Ig somatic hypermutation occurs in secondary lymphoid organs, in the highly specialized microenvironment of the germinal center, and is a T cell-dependent process (2, 42, 43). As we have shown, BCR engagement and CD4+ T cell contact are required to trigger Ig hypermutation (27). Our present experiments demonstrate that the same stimuli also induce somatic hypermutation of the bcl-6 gene in vitro, and provide a mechanistic explanation for the in vivo findings showing bcl-6 mutations in memory B cells and in lymphomas possibly derived from Ag-experienced B cells, namely follicular and mucosa-associated lymphoid tissue (MALT) lymphomas, but rarely in mantle cell lymphomas originating from naive B cells (21, 22, 23). Finally, they indicate that BCR engagement actually promotes the hypermutation process rather than merely mediating higher affinity mutant selection in the maturation of the Ab response, thereby providing fresh insight into the mechanisms of hypermutation and, perhaps, B cell lymphomagenesis. Our results imply that the hypermutation of the 5′-regulatory region of bcl-6 is part of an overall germinal center differentiation program that also includes Ig hypermutation, class switching, and characteristic phenotypic changes, as we have shown in human IgM+ IgD+ CL-01 cells and freshly isolated IgM+ IgD+ B cells (24, 25, 26, 27, 28). bcl-6 encodes a POZ/Zinc transcriptional repressor that negatively regulates the STAT-6-dependent production of IL-4 by CD4+ T cells, as well as the expression of STAT-6-responsive genes in B cells (44, 45). As preliminary results suggest that certain mutations deregulate bcl-6 gene expression and its transcriptional regulatory activity (22), it is tempting to speculate that, under certain conditions, bcl-6 hypermutation contributes to the physiological regulation of IL-4:IL-4R:STAT-6-induced B cell responses, including class switching to IgG and IgE (28), as occurring during a germinal center reaction. The CD28 activation pathway has been reported to be essential for the Ab response to T cell-dependent Ags in the mouse (46). Our previous results have determined that, in addition to BCR engagement, engagement of the CD40:CD154 and CD80:CD28 costimulatory pairs is necessary for the induction of Ig somatic hypermutation in human B cells (27). In this paper we addressed the role of these costimulatory molecules in the induction of bcl-6 somatic hypermutation, and provided evidence that B:T cell contact allowing for CD40:CD154 and CD80:CD28 coengagement is necessary, in addition to BCR engagement, to induce this process. Whether, after BCR engagement, CD40:CD154 and CD80:CD28 coengagement is sufficient to induce bcl-6 (and Ig) hypermutation or signals emanating from the coengagement of these costimulatory pairs mediate the induction of crucial T cell surface and/or soluble molecules and/or factors remains to be determined. bcl-6 gene mutation had been observed in B cell lymphomas of the germinal center/postgerminal center type (47). In some tumors with bcl-6 mutations the bcl-6 gene is translocated into the Ig locus. In this case, the translocated bcl-6 gene has come under the control of the cis-acting elements of the Ig gene and a becomes natural target by the Ig hypermutation, as the c-myc and bcl-2 genes translocated into the Ig locus in Burkitt’s lymphomas do (18). The germline configuration of bcl-6 in CL-01 cells and normal naive IgD+ B cells indicates that the bcl-6 gene is regulated by cis-acting elements structurally and functionally similar to those of the Ig locus, such as the V promoter and/or the Ig iEμ present in the locus of this proto-oncogene. As shown by experiments, such bcl-6 cis-acting elements would respond to the same BCR and T cell signaling-dependent trans-acting factors that induce hypermutation on the Ig locus, thereby suggesting an additional new approach to the investigation of the mechanisms by which hypermutation targets Ig loci. In germinal center B cells, the frequency of bcl-6 mutations was found to be 20- to 100-fold lower than that of the Ig V(D)J gene segment (21, 23), suggesting a relative inefficiency in the somatic hypermutation process of bcl-6. In our Ag-selection-free in vitro system, the frequency of mutations in bcl-6 was comparable to that of Ig V(D)J (2.2 × 10−4 vs 2.4 × 10−4 changes/base/cell division) in the same cells, suggesting that the somatic hypermutation process targets bcl-6 as efficiently as Ig V(D)J. This lends further support to the hypothesis of structural and functional overlap of the bcl-6 cis-acting elements with the corresponding elements in the Ig gene locus and their responsiveness to the same BCR and/or T cell surface receptor-emanating signaling pathways. The hypermutation process targets rearranged V(D)J genes by an unknown mechanism in germinal center B cells where it introduces point mutations. To a lesser extent, it introduces insertions and deletions into a ∼1.5-kb region immediately downstream of the transcriptional initiation site with sparing of the area upstream of the leader sequence, thereby displaying a strong association with transcription initiation. Our findings demonstrate that the same features apply to bcl-6 hypermutation. The published reports on in vivo bcl-6 mutation have been limited to the analysis of the 5′ end sequence of the first intron (21, 22, 23). We showed here that bcl-6 hypermutation targets in addition to the 5′ end of the first intron, the first exon of the bcl-6 gene, while sparing the areas upstream or further downstream of the promoter. In our experiments, the dependence of bcl-6 hypermutation on initiation of transcription is further emphasized by the strand polarity, as suggested by the G>C and T>A bias of bcl-6 mutations. Both in vivo and in vitro studies have shown that Ig somatic mutations are not inserted randomly, and certain DNA sequences and/or structures have been recognized as possible hotspots for hypermutation (27, 48, 49, 50, 51, 52). The identification of sequence-specific preferences by the somatic hypermutation machinery is important as it may provide clues in determining the molecular mechanism of this process. Like Ig mutations in induced CL-01 cells (27) and other human lymphoma cell lines (52, 53), bcl-6 gene mutations preferentially targeted G and C nucleotides. More than 70% of all nucleotide substitutions in the CL-01 bcl-6 were of G/C residues (Fig. 4⇑, Table I⇑) compared with corresponding figures of about 50% for bcl-6 mutations found in the human in vivo (21, 22). Some of the target biases may in fact reflect repair biases in the hypermutation process. The similar pattern of bcl-6 and Ig mutation in CL-01 cells indicates that repair in bcl-6 hypermutation resembles that in Ig hypermutation. Preferential targeting of G/C bases has been observed in exotherms (54) and in Chinese hamster cells (55), suggesting that the presence of a germinal center microenvironment might be crucial to recruit a non-G/C-biased stage of mutation generation or the activity of certain trans-acting factor(s) which act(s) to preferentially revert mismatches mainly at G and C in both Ig and bcl-6 genes. The G/C biased pattern of hypermutation is displayed by Msh2- and Pms2-deficient mismatch repair protein-deficient mice (56, 57, 58, 59), indicating that the mutations that preferentially target G/C nucleotides of bcl-6 and Ig genes could likely result from the lack of a component of the mismatch repair system in CL-01 cells. In human B cells, bcl-6 hypermutation is likely part of an overall regulatory germinal center differentiation program, in which bcl-6 acts to prevent apoptotic cell death, and may contribute to modulating the withdrawal from the cell cycle (60). Hypermutation of the 5′ putatively regulatory region of the bcl-6 gene may lead to alterations of crucial steps of the B lymphocyte cell cycle and lymphomagenesis (61). As emphasized by our findings, significant differences exist between the human and the mouse B cell hypermutation machinery. In contrast with human bcl-6, mouse bcl-6 has been shown not to be the target of hypermutation (12), indicating that different cis-acting elements are associated with the human and mouse bcl-6 genes and/or that different levels of transcription activity exist in the B cells of the two spices. Understanding these differences will possibly further our understanding of the mechanisms of hypermutation. We thank Shefali Shah and Anna Vergun for their skillful technical assistance. ↵1 This work was supported by the U.S. Public Health Service-National Institutes of Health Grants AR 40908 and AG 13910, and a Research Grant from the S.L.E. Foundation, Inc., New York, NY. A.C. was the recipient of an AIDS fellowship from Istituto Superiore di Sanita’ (Rome, Italy). ↵3 Abbreviations used in this paper: BCR, B cell Ag receptor; MBR, major break-point region; iEμ, intronic Ig μ enhancer; SSCP, single-strand conformational polymorphism. Ikematsu, W., J. Kobarg, H. Ikematsu, Y. Ichiyoshi, P. Casali. 1998. Clonal analysis of a human antibody response III. Nucleotide sequences of monoclonal IgM, IgG, and IgA to rabies virus reveal restricted Vκ gene utilization, junctional VκJκ and VλJλ diversity, and somatic hypermutation. J. Immunol. 1612895..